Welcome to my Monday Morning Momentum March/April 2016 videos and associated resources. ​The theme for March/April 2016 was Sustaining shared-view in the seven areas of significance where the most successful leaders stand out. This follows on from the theme for February 2016 which was Leadership, Management, and Culture 3.0, and the theme for January of 'The four fundamentals for increasing employee engagement'. You can view January's videos and download the handbook here and February's here. Please note there are links to the above via handbook #3. below. Most of our troubles, personal, local, organisational, national, and international, are fundamentally based in our perceived need to hang onto the world in here (my view), our issues with the world out there (other people's views), and, our failure to focus more on the world we share (ours). The exciting news is that when we find and sustain shared-view (ours) we can triumph over all our troubles. Decide on the one action you will take this week, or that you can incorporate into your work in the next 90 days. The 'one great idea' is that full appreciation of what is, dramatically increases your likelihood of achieving what can be (possibility). The 'one great idea' is that what we truly believe we can achieve. 3) Why you're going where you're going (purpose). March 21st, 2016. The 'one great idea' is that your life only has one purpose, so does your business, and the two are connected in an unbreakable way. 4) How you'll get there (strategy). March 28th, 2016. The 'one great idea' is that strategy is the compass that guides your personal and business decisions, and execution is the map. 5) Who will do what and when (execution). April 4th, 2016. The 'one great idea' is that clever answers often hinder execution, whereas wise questions accelerate the process. 6) How you'll know you're on track (milestones and lead measures). April 11th, 2016. The 'one great idea' is that in the new world of work only the milestones and lead measures that have meaning for people have value. ‘What gets measured gets done’ is only partly true. 7) How you'll behave along the way (culture and values). April 18th, 2016. ​The 'one great idea' is that behaviour determines your culture. If you want to go deeper into the 'one great idea' presented in each video above, please download the handbook by clicking on the cover below. You'll find the working on yourself and on your business exercises relating to the 18th April video above on pages 19 and 20 of handbook #3, which you can download below. The model referred to is on page 21 of handbook #3. You can download the diagnostic and the checklist from inside handbook #3 or h﻿ere. 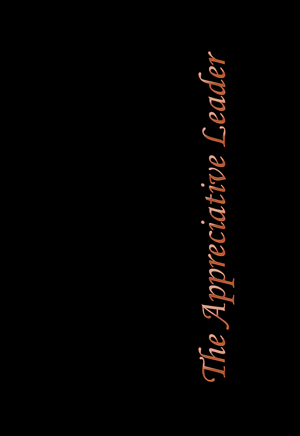 Since the publication of the above handbook, and the 3 others in the series, I've put everything together into one resource, 'The Appreciative Leader' handbook. If you're not yet receiving notification via email of when videos and resources are uploaded, and you'd like that convenience, click on Yes Please. You'll be able to download my Changing What's Normal book as soon as you register. Every time a digital copy of my book is downloaded, 12 families in need receive 3 nourishing meals through my partnership with B1G1. Without nourishment no one can fully appreciate and get the best out of themselves. B1G1 – 86 million+ micro-giving activities. Join the revolution yourself here.